When I headed into Carnaby Street in London, I was surprised to find that John Steed and Ace Face were nowhere to be seen. Surprising, but I couldn't hang around to see if they turned up. I was there to pick up a scarf from Peckham Rye to wear with the coat you see here. I went with a classic Paisley pattern in the end. Paisley is the Victorian term for the Eastern-influenced 'teardrop' motif that derives its name from Paisley in Scotland where much of the domestic manufacture took place. Friend of the The Tweed Pig, the genial Martin Brighty from Peckham Rye assisted with the selection. The scarf is an allover Paisley print on silk twill with blue background. Made by Peckham Rye it has their trademark long hand-knotted fringes. Handsome. Did you know made-to-measure suits were available from Peckham Rye? The suits are labelled Tommy & Charlie Mccarthy, after father and son family members who operated as military tailors 200 years ago. Tommy started as a tailor for the East India Co in 1813; his son Charlie joining the family business at the ripe old age of 9. With the 303 suit block - 303 was Charlie’s regimental serial number - Peckham Rye aim for a 'distinctive London flavour' with their suits, and to bring a little sharpness back into dressing. The blue overcoat with raglan sleeves (pictured) is by Mulberry. I need to be careful with this coat —Mulberry menswear is no more, gents. First it was furnishing, then the menswear. Mulberry now cater solely for women. I'm sorry to see them go. They had some nice things for men. I often regret not getting that vicuña overcoat of theirs when I had the chance, as I've pointed out on more than one occasion. 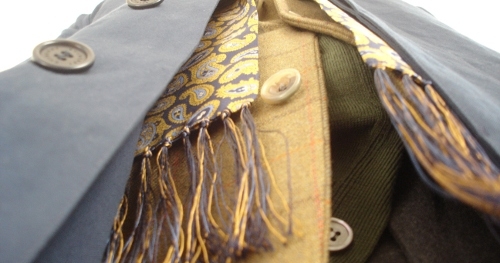 The fabric on this overcoat is a blend of paper and cotton. It feels pretty robust, and I was assured it was when I bought it, but I have my doubts about the longevity of a coat made of paper. I spotted the Japanese chap (below) wandering around Carnaby Street shopping. He wasn't out to buy a Gap T-shirt, let me tell you. He was seeking out genuine British merchandise and there simply aren't enough shops to supply that need to the tweed-clad tourist. This is where The Tweed Pig tries to help out. Sensing an opportunity — and fighting my natural English discomfort at drawing attention to myself and approaching someone without introduction — I tried to offer some advice through his interpreter and also misguidedly chanced my arm to see if he would like to be one of our pin-ups. Lots of smiling and much misinterpretation left us both with red faces. He was happy to have his photo taken though, but sadly no background information on the duds.